Following the 2010 election and the coalition government it looked like any form of regeneration was off the cards under the excuse of “austerity”. I’ve co-edited a book – After Urban Regeneration – that argues this very point. My research had turned to broader questions of inequality in our cities, particularly what the increasing focus on community engagement and involvement in service delivery might mean for inequalities in service delivery. And then David Cameron goes and announces a new ABI on the Andrew Marr show. Thanks. I’m back in business; or am I? First of all, as many have pointed out, the amount of funding for this ABI is pitifully small. It’s the same as the former Community Regeneration Fund in Scotland spent in one year – and that was in 2006 when the money was worth more and in a country ten times smaller. But it looks like it’s just enough money to prompt the private-sector to “regenerate” some of the neighbourhoods concerned; to remove the risk of having to get rid of pesky tenants or asbestos. This is the continuation of the processes happening in numerous estates in London that do not deserve the title of “regeneration”. It is state-funded removal of low-income households from our cities. Secondly – as any human geographer, economic geographer, planner or policy analyst worth their salt will point out, ABIs don’t work; or at least they’re very bad at doing what David Cameron thinks they are good at. In terms of the causes of neighbourhood deprivation, I can’t bang on about this enough. Saying deprived neighbourhoods cause deprivation is like calling a bucket you have filled with apples an apple tree. Deprived neighbourhoods exist because, either, we put all our social housing in one place (something Scotland is particularly good at doing and is repeating), or wider macro-economic forces mean that a neighbourhood is a risky investment proposition so property values and rents fall, so it becomes somewhere where households with a low income end up living. There is some evidence in some circumstances that “neighbourhood effects” exist – that is, living with lots of other people in poverty decreases your chances of escaping poverty. But that evidence is very scant, and as Tom Slater highlights, it is macro-economic processes, still, that cause the concentrations of deprivation in the first place. So, ABIs don’t work because they misidentify the policy problem – they look to solve a problem in neighbourhoods that isn’t there. They also don’t work because, well we just know they don’t work. As this blog from the RSA highlights, the biggest ABI ever, the New Deal for Communities, achieved some change in some indicators, and some of this was caused by broader processes of gentrification in London. As a lot of evaluations of ABIs have shown, and was picked up in my own research, ABIs are very good at changing physical things in neighbourhoods – building new housing, refurbishing housing, building new schools, doctors surgeries, libraries etc. But these rarely cause long term change in the outcomes for the residents. That occurs through enhancing services in the neighbourhoods – more resources for schools; public health interventions; employability projects – and the gains from these often leak out of the neighbourhood and cease pretty shortly after the ABI has ended. But, as has been recognised from the 1990s, politicians like ABIs because it makes it looks like they’re doing something about something. Also, communities often like ABIs and the physical renewal they produce because it makes them feel like something is being done about something. And, much as I criticise ABIs, I do agree with the broader premise of them that if you invest in deprived neighbourhoods they will get better. The trouble with ABIs is the “boot-strap” approach – that this is a one-time fix. It is not, and the investment needs to continue in perpetuity. I would welcome a return to a proper regeneration policy as England had until the Treasury Sub-National Review prioritised neighbourhood spending delivered through local authorities, nested within city-wide economic policies, nested within regional policies that sought to encourage economic development and rebalance growth. If you slapped a layer of national planning on top of that it would have been grand. You also probably would’ve been called a Communist. Cameron’s regeneration policy is not this. As a piece coming out in the journal I’m on the editorial team of, Local Government Studies, highlights, the ending of the Revenue Support Grant for local authorities in England is leading us in into terrifying and uncharted territory. Local authorities, or the wider city region authorities being created, will be entirely responsible for raising their own revenue, no matter how flimsy their tax base is. As Michael Lord Heseltine laughably suggested on BBC Radio 4’s PM last October when this was announced, the idea is that if a local authority like Sunderland wants the tax base of Westminster, then it just has to drop its taxes to attract in new business and households. If only urban policy was as simple as it is in Sim City. Under the guise of localism, this government is locking the UK into a framework of the spatial distribution of economic growth last seen for a brief period in the UK between 1848 and 1870 – when the Corn Laws stopped artificially supporting the agricultural economy of the south and before central government grants to local government started. When central government expenditure does have a spatial impact it is the inverse of what might be considered progressive: the cuts to welfare benefits, as analysed by CRESR which massively effect the north of England, Scotland and Wales; the infrastructure expenditure as analysed by CRESC which massively benefits the south of England and London; the billions cut from the budgets of the most deprived local authorities, as analysed by research funded by the Joseph Rowntree Foundation. By 2020, I’d be interested to know if there was any country that did less fiscal work spatially redistributing the benefits of economic development than the UK. So, David Cameron has launched an ABI. To say he’s launched a regeneration policy is an insult to the thousands of people who have created and implemented regeneration policies since 1968. Given the pitiful sums involved, I doubt we can even call it state-led gentrification. But in broader policy changes this government is creating a tidal wave that will lead to the UK being a massively spatially unequal country. Deprived neighbourhoods will be like baby turtles being tossed around on the massive outflows of capital from towns and regions. This expenditure will distract a shark from eating them for a few seconds; it definitely isn’t a life line. Dr Peter Matthews is Lecturer in Sociology, Social Policy & Criminology at the University of Stirling. 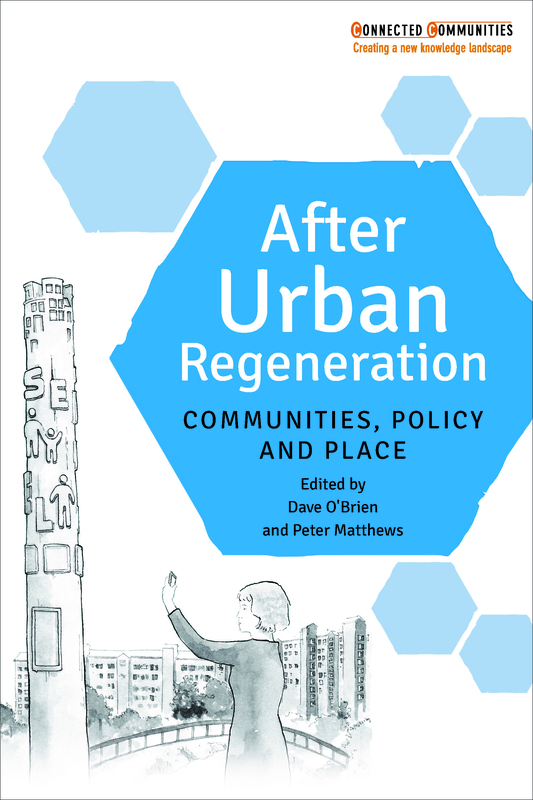 He is the co-author with Dave O’Brien of After urban regeneration: Communities, policy & place, published by Policy Press. For this month only you can buy After urban regeneration: Communities, policy & place for just £15.00 (RRP £24.99) here.